Detroit News political reporter Chad Livengood discusses the presidential race in Michigan with pollster Richard Czuba. Democratic presidential candidate Hillary Clinton has moved to a 7-percentage-point lead in Michigan over Republican Donald Trump in a statewide poll conducted after the candidates’ first debate Monday night. Clinton leads Trump 42 percent to 35 percent in a four-way race and maintains a seven-point lead in a two-way matchup against the New York billionaire, according to the poll commissioned by The Detroit News and WDIV-TV. About 9 percent of likely voters said they favor Libertarian candidate Gary Johnson, 3 percent are siding with Green Party candidate Jill Stein and 9 percent remain undecided in the poll of 600 likely voters conducted Tuesday and Wednesday by Glengariff Group Inc.
After Monday’s debate, 62.5 percent of voters said Trump is unqualified to be president, compared with 57 percent who believe Clinton is qualified after years in the public spotlight as first lady, U.S. senator and U.S. secretary of state. A July 30-Aug. 1 News-WDIV survey conducted after the two national conventions found 61 percent of likely voters said Trump was unqualified to lead the country. “In the next debate, he’s going to have to focus on this issue,” Czuba said. About 52 percent of likely voters said Clinton won Monday’s 90-minute slug fest at Hofstra University in New York, while 20 percent said Trump prevailed. Among Trump voters, 45 percent said he won, while 88 percent of Clinton’s voters said she won the debate, Czuba said. “Even Trump voters had a hard time giving Trump the debate win,” he said. Clinton had a 9-point advantage over Trump in The News’ post-convention survey, which found Trump trailing his Democratic opponent in the Republican stronghold of west Michigan. The latest survey shows Trump has pulled ahead of Clinton in west and southwest Michigan, but still trails her by 20 percentage points in the electoral battleground of Oakland County. Trump is traveling to Grand Rapids on Friday, after multiple Michigan visits, for a mid-day fundraiser and then headed to Oakland County for a 5 p.m. rally at the Suburban Collection Showplace in Novi. Trump’s bright spot is Macomb County, where he holds a 20-point lead. He has built a base of blue-collar support as he rails against international trade deals that he blames for the decline in manufacturing jobs in Michigan since Clinton’s husband was president. “In just the last two months we have seen a consistent trend in Michigan polls that reflects the increasing energy and enthusiasm for Mr. Trump and his plan to bring back jobs, increase wages, and take our country in a new direction,” said Scott Hagerstrom, state director of Trump’s Michigan campaign. But Trump’s efforts to court African-American voters in Michigan through recent trips to black churches in Detroit and Flint has done little to change his polling numbers with this bloc of reliably Democratic voters. Clinton held a lead of 80 percent to Trump’s 3.5 percent among African-American voters surveyed. No Detroiters said they planned to vote for Trump, Czuba said. “He has made no headway, whatsoever. None,” he said. Clinton’s favorability rating among likely voters saw a slight uptick since early August, rising from 37 percent to 41 percent. About 52 percent of likely voters still view her unfavorably, while 61 percent of voters have an unfavorable opinion of Trump. Republicans contend Clinton’s trust issues with voters keep the Great Lakes State still in play, despite five consecutive presidential election losses for the GOP in Michigan. 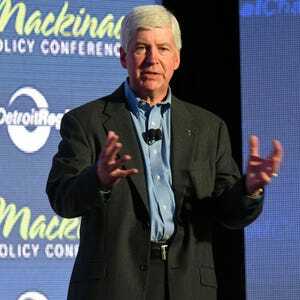 “The fact that such a career politician like Hillary Clinton hasn’t been able to put this thing away in Michigan is rather surprising and speaks to her weakness and her frailty as a candidate,” said Greg McNeilly, a Republican political strategist. Since the August poll, Trump has seen his lead among male voters widen from 1.5 percentage points to nine points, 44 percent to 35 percent. The margin of error was plus-or-minus 4 percentage points. But Clinton continues to hold a commanding 21-point lead over Trump among female voters. Clinton, the first female presidential nominee for a major political party, has sought to capitalize on Trump’s struggles with female voters. In Monday’s debate, Clinton accused Trump of shaming a former Miss Universe winner for her weight after she won the beauty pageant he once owned. Clinton alleged that Trump called Venezuelan-born Alicia Machado “Miss Piggy” and “Miss Housekeeping” because she is Latina — assertions Trump did not dispute. The next day, Trump responded in an interview on Fox News by saying Machado “gained a massive amount of weight” and that her weight “was a real problem” for pageant organizers. The Clinton campaign responded with a video showing 20-year-old footage of Trump inviting TV news crews to film Machado working out and saying her weight had risen from 117 points to more than 160 pounds. “So this is somebody that likes to eat,” Trump said. Clinton and her supporters have seized on the remarks in an attempt to portray Trump as misogynistic. Trump and his allies have signaled they might get more personal and resurrect former President Bill Clinton’s marital infidelities. “I would advise Hillary Clinton to focus on the issues of this race and not go 20 years back into Donald Trump’s past because she certainly doesn’t want Donald Trump to go 20 years back into her past,” said Ronna Romney McDaniel, chairwoman of the Michigan Republican Party. But Trump’s public criticism of Machado’s weight comes after a series of other harsh comments he has made about Hispanics, including a federal judge who is overseeing a fraud lawsuit against his Trump University. “He has a bias toward everyone who’s not his color,” said Ramona Paredes, a 50-year-old grandmother of Mexican descent from Waterford. Paredes participated in The News’ poll and said she is voting for Clinton. “I’ll take Hillary — Donald just scares me,” she said. Going forward, Trump’s strategy for handling the issue should be simple, Czuba said.